Blogging is an important part of any inbound marketing strategy. Publishing valuable posts for our personas on a consistent basis keeps marketers very busy. Analysis of our blogs reveals that some posts perform much better than others…especially over time. Considering the amount of time and energy that goes into a successful blog, wouldn’t it be great if all of our posts performed that well? 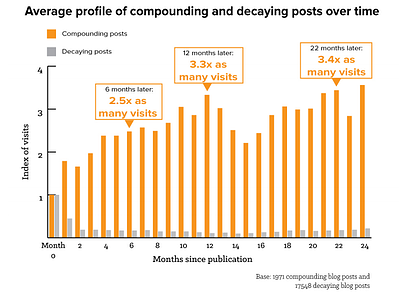 The high-performing posts I am referring to have a name…they are called compounding blog posts. Earlier this week, HubSpot released a new research report titled Compounding Blog Posts – What They Are and Why They Matter. As a company that publishes blog posts on average three times per week for ourselves and also advises many clients on blogging, we were very interested in the findings of this report. Let’s start by defining what a compounding blog post is. A compounding post is one that grows in traffic over time. The opposite of a compounding post is a decaying post. A decaying post declines in traffic over time. See the graph below. In general terms, if I apply those statistics to Imagine, it means that of the approximately 150 posts that we will publish this year, only 15 will be compounding and the rest will be decaying. That leaves 135 posts that aren’t doing much for us. That’s a lot of time spent planning and writing that will probably not generate much of a return. I think it is the goal of most marketers to write posts that perform. Based on this research report, I think it is worth the time and energy to learn how to write compounding posts. Thankfully, the report includes a section on how to write them. I will summarize it here. Broad topics that teach and appeal to a large audience perform better over time than those with a narrow focus or a topical subject. For example, try reviewing a product that is relevant to your personas or provide instructions for diagnosing a problem or issue your personas may be experiencing. At Imagine, one of our top performing posts over time is a post titled, Is HubSpot’s CRM living up to its promise? The post describes why HubSpot’s CRM is different than others, who it is right for and some of its best features. Many of our clients and prospects have struggled with a CRM system in the past…across verticals. Providing information about how HubSpot’s CRM works is very relevant to all of our personas – it is broad and appeals to a large part of our potential audience. The graph below shows how traffic has grown since it was published in late January. On the other end of the spectrum is a post called Is it the Beginning (or the Middle) of the end for Apple. This post was written in response to the announcement that Apple and IBM had decided to team up to develop business apps. It is a very topical post and it has performed as such…like a decaying post. See the graph below. The title of your post can be a very important factor in whether or not it becomes a compounding post or a decaying post. Your customers and prospects probably search for answers. They use phrases like “how do I” or “the best way to” or even “what is”. The HubSpot research shows that, not surprisingly, the six most popular words in compounding post titles are how, your, what, best, why and tip. The report also showed that the posts with the most traffic had between 11-13 words in the title. At Imagine, we write lots of posts that include “tips” for achieving something. About this time last year, we published a post called 5 Tips for Conducting an Effective Sales Pipeline Review. While the title only has nine words, it appears to performing as a compounding post. According to the study, compounding posts consistently include images, bolded headlines, bullet points, answers to the reader’s question, links to other information and are thorough but short in length. Making your post easy to scan will improve its chances of becoming a compounding post. Use images, bolded titles and bullet points to make it easy for the reader to understand your message. Instead of trying to include too much, refer the reader to a link where they can learn more about a related topic. Length can be unique to every organization. The key is to make sure your posts include enough information and details to answer the question without being too long. In some industries, long-form content performs better. Do your own research to identify the length that works for your personas. Compounding posts can make a significant impact on the number of visits to your site. Take the time to identify your own posts that have performed well over time and add similar topics to your editorial calendar moving forward. Click here to get your own copy of the entire HubSpot report.